This week I used up some of my husband's frequent flyer points to take a trip to Sydney with him. As I mentioned in a previous post, I have started a new adventure teaching Social ArtWorking Classes. The Australian Distributor for the Social ArtWorking products is located in Sydney. 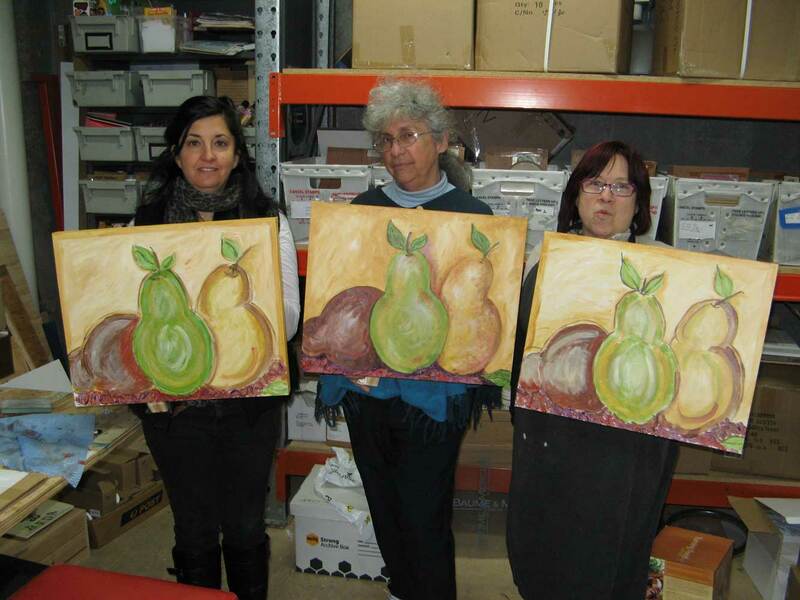 I mentioned to them that I could come and demonstrate just how easy it is to teach and do the painting classes. We arrived on Sunday morning and my demonstration was not till Tues. 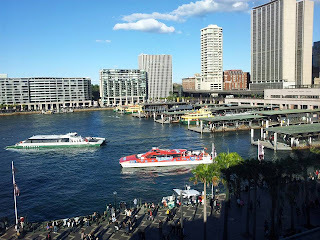 So, I had few days to have a wander around Sydney. Sunday we went to the Aroma Festival. I thought it was a brilliant idea to have food and my favorite liquid, coffee while enjoying the atmosphere at the Rocks, Sydney. There were way to many people for my liking. The lines were extra long, and getting food was an excercise in 'How to deal with Crowds'. We decided it was easier to visit the Museum of Modern Art and have a coffee there where it would be much more relaxing. After spending 20 minutes getting food from a food stall, the Museum of Modern Art Cafe was much more relaxing. We could watch the crowd from our nice quiet seats in the cafe. 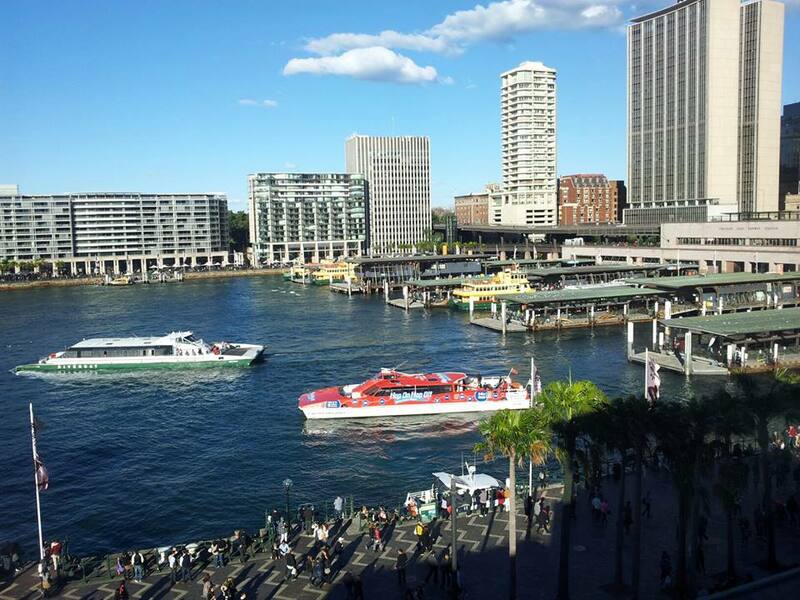 What a view of Circular Quay.! 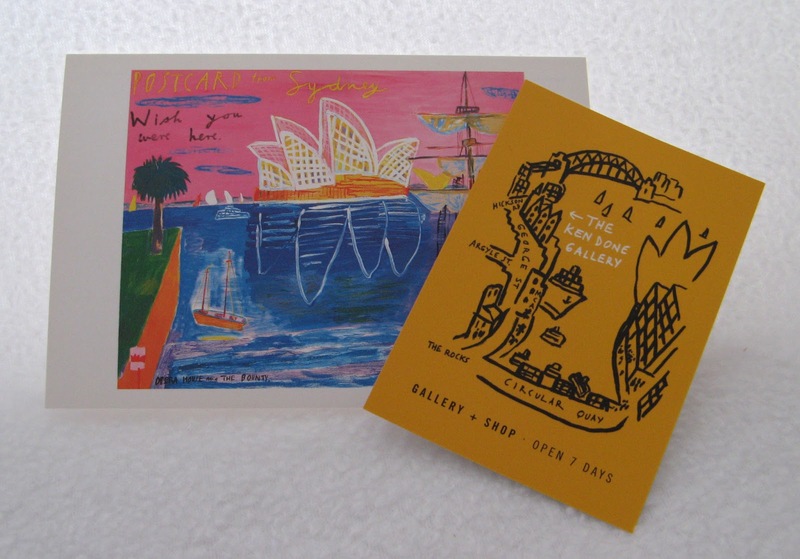 While at the Aroma Festival we passed by a famous Australian Artist's gallery Ken Done. Ken Done has been a favorite artist of mine since I moved to Australia. The first time I saw his paintings I secretly wished I could learn to paint like that. Only we could not just hop on a trolley car. What a view we had from the Hotel room at the top of that hill where our hotel was!! It was only because my camera batteries went flat and my stomach was growling that I stopped. .....I STILL had that HILL to climb to get back to the hotel. LOL Our Hotel was at the top of a hill that could not be avoided! After the long day walking, taking photos and enjoying the sights, it was off to dinner.....You guessed it.... more HILLS ROFL. I was getting good at being a mountain goat. At the end of the night I looked at my ipod to see how many steps/km I had done....It said I had done over 12km! Tuesday, Each day I walked to breakfast, lunch and dinner. Tuesday, I walked with my husband to the office he was working in. Up hill and down hill, then back to the hotel after breakfast. I had already walked 3km. 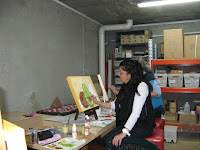 I had a demonstration to do in Banksmeadow, NSW that day. This was the reason I came to Sydney with my husband. At least the walk to the buses from the train station was only a few metres :>). I had such a good time demonstrating how easy and fun Social ArtWorking is. 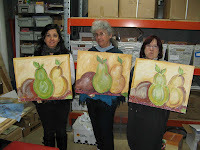 I demonstrated the Pear Trio pattern to the Distributor for the Social ArtWorking products here in Australia. Before we went to sleep, I checked my ipod again to see how much walking up and down hills I had done that day. Whew, only 8km. Still getting up the hill to the hotel that night it felt like a mountain! I counted that day, I had gone up the hill to our hotel 3 times just in that one day. My feet were starting to get sore and my legs were a little stiff from all the walking. So...What was I suppose to remember....Oh yes I remember now... "P. Sherman, 42 Wallaby Way, Sydney"
Wow, what a view. 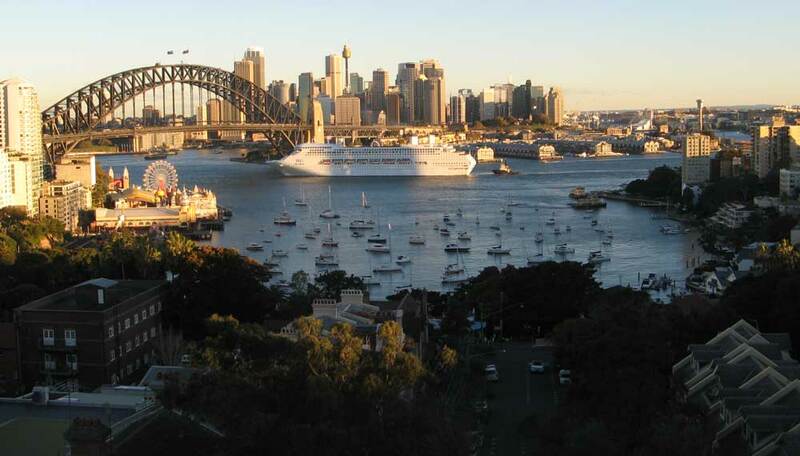 I would love to visit Sydney, it looks beautiful! Thank you for sharing at the Krafty Inspiration Thursday Party. Don't forget to stop by next week to see if you have been featured. Thanks for stopping by to visit. I will certainly visit next week. Love your site. So much exercise! That's probably a good thing! 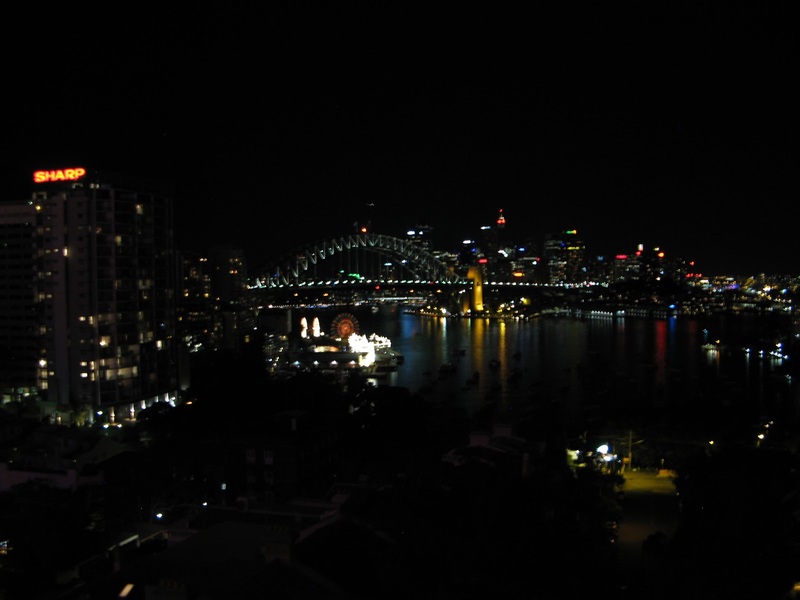 I love those photos of the sydney harbour bridge. you should see our story bridge here in brisbane...much the same! Anyway, thanks for stopping by my blog too. Thanks Judy. 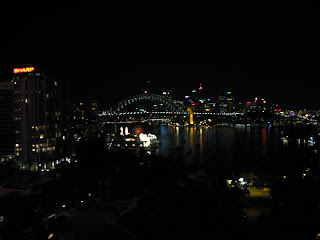 I have been to Sydney several times and lived there for a while but never got to see the Bridge from that angle. I have to get to Brisbane one day. My calves are aching just reading this! ROFL Mine certainly ached by Wed morning. Thanks for visiting. Thank you. I am glad to hear I portrayed your city well. It is a beautiful city. 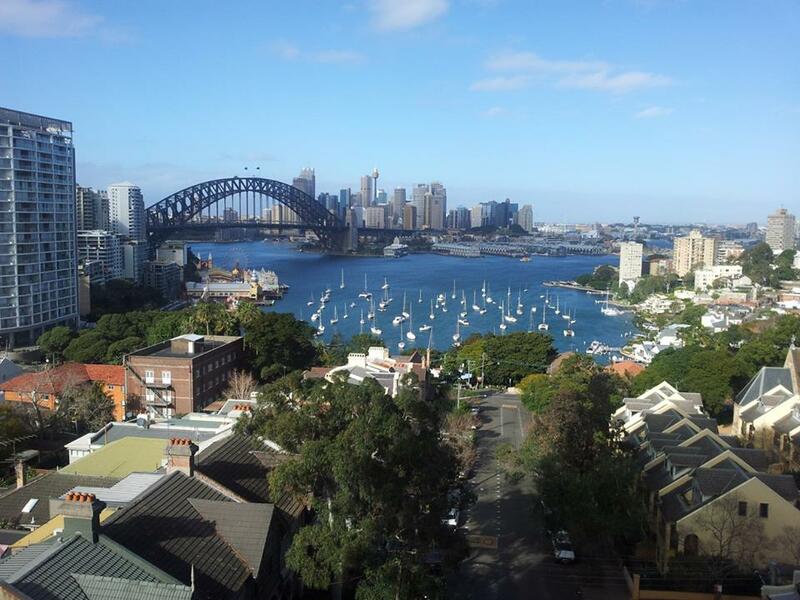 Though I am a country girl born and raised in small towns, I have always loved Sydney. 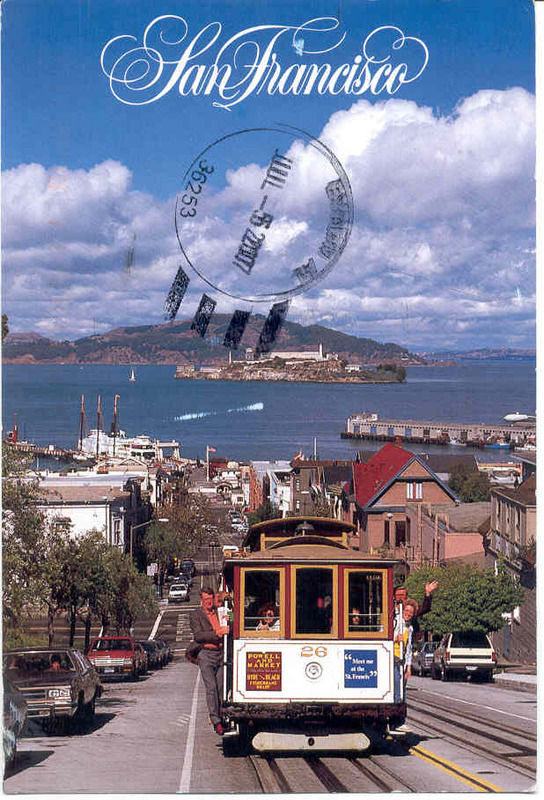 I love the pictures and am inspired to go to Sydney...even if it means walking up some killer hills. :) Thanks for finding us at Pin It Tuesday! There are some killer hills dotted around Sydney. Most of the city is easy to navigate but the North Sydney area is all hills! That is where i took these photos from North Sydney area, Kirribilli, and Lavender Bay areas. Good cardio hills! Absolutely wonderful! I love the pictures! Happy to have found your blog through the JustByou Blog Hop! Thank you Maria. I was worried that I might not have any good pictures as my camera is one of those point and shoot types that does everything automatic cause I am not good at photo taking. Thank you. I love going back to Sydney, it never loses it's appeal. Walking aside, it sounds like you had a great time in old Sydney town Tracy. Thank you for linking up at Shabbilicious Friday. I certainly did have a great time. I always do when I go to Sydney. Beautiful pics of what looks like to be a beautiful and interesting place!! Thank you Debbie. Sydney is a lovely place. I love visiting there every chance I get.